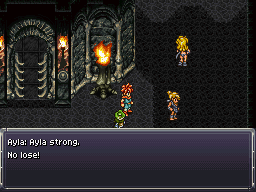 You'll have Ayla in your party no matter what for this chapter, although you can pick the third member if you wish. You can take her to the End of Time to meet Spekkio if you want, but she won't be able to learn magic since she predates its existence on the planet. Stop by the trader hut to pick up the best weapons and armor available if you haven't already, and fly your dactyl into the Tyrano Lair to move on. Since this is your first time when you're able to fly, I think I'll just point out that you can press select to view the world map to get your bearings, and there's a sun keep you reach to the northeast of the map although you can't do anything there yet. The Tyrano Lair is the silver building in the middle of the continent. I'd recommend equipping the rage band on Ayla, and the Silver Stud on Crono to make lightning attacks more affordable. Frog and Robo probably have some good multi-heal techs at this point, or you could rely on Marle. Anyway, clear out the first room of enemies and enter the right skull to go down some stairs. Fight some reptites in the next room, and you can open the jail cell to free some prisoners or not, Kino will open it later anyway. Fight a couple more sets of reptites, and Ayla will bust Kino out, grab the Mid Ether in his cell then follow him to the entrance and he'll open up the left skull in the entrance hall so you can move on. Kino is now free and will help you opening the left skull in the entrance room. Step on the switches on either side to send the monsters tumbling to a lower level so you don't have to fight them. Head down the right path and through a door to find two eggs. The left one has a Full Tonic, and the right one will send you back inside the old jail cell where the monsters who you made fall down earlier will be waiting for you, and you'll have to climb back up. One word on fighting the monsters, shock the Terrasaurs, and attack the volcanoes to make them erupt damage on all the monsters on their own side. To get the Meso Mail, walk onto the circled teleport. Go down the left path and through a door to find a room full of teleports. Standing on some of the squares will get you into fights with monsters, and some will transport you around the room. The only two items worth having are the CeraTopper helmet and Meso Mail, the other treasures in this room are Tonic and Revive, so once you have those you can move on. Just experiment and try stepping on each square if you're having problems finding them. Go through a room and past a sealed door, to find a room with two switches. The left one will send in some monsters to fight you, and the right one will open the skull so you can flip a switch to open the sealed door. Head through the sealed door, talk to Nizbel II if you like, and save or use a shelter. If you try to head North and Nizbel the second will challenge you to a fight. Releases absorbed electrical energy: Does about 180 lightning damage to everyone. A charging attack that hits everybody for about 50 physical damage. A ramming attack that hits one person for about 70 physical damage. As usual, shock him then hit him with your best attacks, have someone like Frog or Robo on hand to heal the party if you like and don't rule out other support spells like haste or protect. His defense will lower every time he's shocked by Crono, and it will rise every time he's attacked. When he releases stored electrical energy, it will do about 100-200 damage, so try to keep your health high. Similar to the first Nizbel fight, only attacking him raises his defense, and shocking him lowers it. He has increased speed so you won't be able to drown him in Lightning like you could on Nizbel. Have Chrono use Lightning magic pretty consistently, have Ayla use dual techs and healing techniques (group if possible) and the third member help with dual techs and healing if possible. As energy gets stored within him, the damage you deal will increase by about 200 every time, so long as you don't hit him with physical attacks it will continue to grow until he releases his stored energy, at which point you'll go back down to normal damage for one round. At level 26, you'll probably have access to Slurp Kiss, Volt Bite and Spire. The strategy for Nizbel is to never hit him with a normal attack, since his defense gets reduced more and more (eventually doing incredible amounts of damage). Equip one of your party members with the rage band, since he does group attacks; the band will probably end up adding an additional 400-1200 damage during the battle. If you focus Chrono and Ayla completely on casting Volt Bites and have Frog wait to heal whenever needed, you'll save MP while taking him down in just a few hits. By the end of the fight, you'll probably see hits of over 1400 damage! Save and heal once you've beaten him, and head up and through another area with a sealed door. Enter the right passage to find three switches. The center switch will make a save point appear, the right switch will make two terrasaurs appear, and the left switch will make a hole appear where the terrasaurs and the save point would appear. If you fall in either of the holes you'll end up in the previous room next to a sealed door, with possibly the terrasaurs for company. You can go straight through the skull, grab the Full Ether in the egg and flip the switch in the back to open the sealed door. Head through the center door to meet Azala in her throne room. Pick up the Mid Ether and CeraTopper helmet once he's done talking, and make sure to equip it. Head into the back and prepare to fight Azala and the Black Tyrano. Teleportation: Azala this will summon a rock to smash one person, doing about 70 damage. Psychokinesis: Azala will throw one of your party members around, doing about 70 damage, and maybe putting them to sleep. When Azala dies, she'll use Azala Break, which inflicts HP Down and does about 30 physical damage to everyone. Fire Breath: fire attack to one target. Slurp: physical attack to one target. 5,4,3,2,1: Black Tyrano will roar. This is time spent charging up for a strong attack. Use this time it to heal. It counts as an attack, so if you have a rage band equipped you can counter it. 0: releases stored power. It will damage all of your characters for between 100 and 300 damage depending on whether or not you're wearing Ruby Vests. First of all, make sure you're wearing Ruby Vests on all three characters. Note that the Black Tyrano is mostly fire based, so he won't be dealing much damage to your party if you have the equipment. Second, Azala is weak to lightning, and the Tyrano is weak to physical (once his defense is down). Concentrate your attacks on Azala to begin with because the Black Tyrano won't have lowered its defense and it has almost four times as much HP. Azala is weak against lightning and most magic. Physical damage doesn't seem to have too much of an effect on her. After you defeat her you can focus on the Black Tyrano. Notice that the Black Tyrano is heavily physical resistant. Eventually the Black Tyrano will start counting down. At this point its defense will drop. It is weakest to purely physical attacks. Take the time to hit it with everything you have and heal your party to the max. The Black Tyrano's charged fire attack can do around 300 damage if no fire resistant armor is equipped. If Crono knows Life you'll have an advantage, otherwise just keep everyone healed up. While you're waiting for the next countdown to begin, just use normal attacks so you don't waste MP. Something will crash in Tyrano Lair. After you finish off the Black Tyrano, something will crash to Earth and Ayla will name it Lavos (La=Fire, Vos=Big). 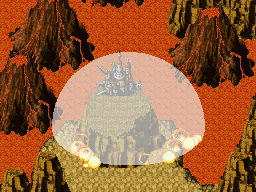 Azala will stay behind to be wiped out with the reptites, and Crono and company will explore the wreckage to find another time gate, guessing that the intense energy Lavos gives off distorts time and creates time gates. Your party will enter the gate to travel to 12,000 B.C., and wind up in the next chapter. If you go back and challenge Lavos at this point, you should get The Reptite Ending. You'll wake up at the start of the game where everyone is a reptite, including yourself. Presumably without your help Ayla wouldn't have been able to defeat the Black Tyrano on her own and Reptites would have ruled the past. However, if you challenge Lavos in the brief section of this chapter after you defeat Black Tyrano but before you advance to 12,000 B.C., you'll watch The Prophet Ending instead. This page was last edited on 1 December 2017, at 21:07. This page has been accessed 121,398 times.